..I think you all know the lyrics. 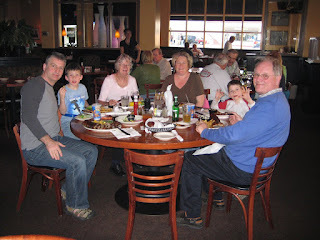 My parents minded the boys for a weekend while Nigel and I spent a child-free weekend in San Francsico. As usual we did not do a whole lot. 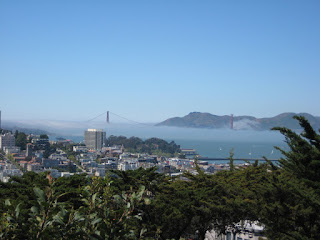 We walked to the Coit Tower and enjoyed the view, then walked down the steps to the Embarcadero. 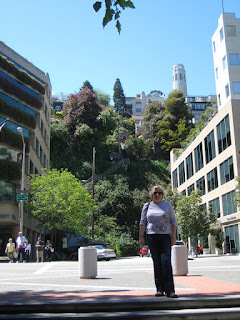 I like the photo below as it shows how steep Telegraph Hill is. 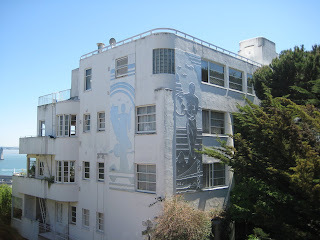 While we were walking down we met a US Census agent preparing for the 2010 (I think) Census. She was trying to reconcile postal addresses with the 'street' address...not an easy job in that area I should think. 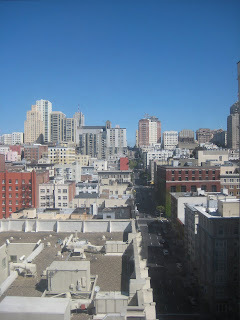 We stayed at the Serrano Hotel which was great. Our suite had this view from one of the windows...we could see the cable car crossing on California, especially at night. We ate one night at the hotel's restaurant Ponzu which we enjoyed and returned home on Sunday refreshed, revitalised and looking forward to seeing the boys! We visited during a record-breaking heatwave in California so it was pretty warm in the city, and nice to get home to the pool...now open for the season. While we have had visitors my knitting has focussed on socks... As well as a secret pair for my dad in Dream in Color Smooshy (no picture) Finlay received another pair of socks. In Kaffe Fasset's colours for Regia, these are the 6-ply sock yarn. Basic recipe as usual. 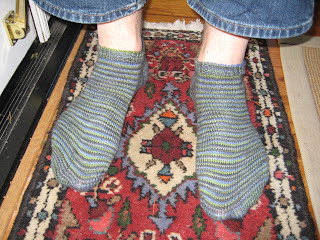 I also knitted a short pair for Nigel from Tess's designer yarn. This is yarn that I particularly dislike for it's colour bleeding issues, but love for it's longevity! The usual pattern - knitted short for summer. I also repaired Finlay's celtic socks. I noticed that they were very short and realized they had felted and shrunk so I cut off the toes, picked up the stitches again (which was very painful as they had felted - but I used a darning needle which worked OK), and knitted the toe again 2" longer. I was disproportionally pleased with myself. 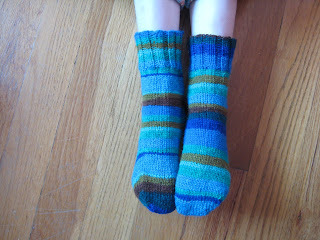 There were other socks too - but I have not yet taken picures so will need to wait for another post. I don't seem to have any photos of my birthday which I also celebrated in April, but we had a lovely day out on my Mum's birthday. 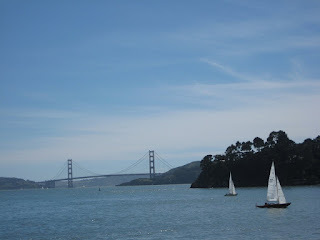 She requested a day out on the bay, so we headed up to San Francsisco and took the ferry to Tiburon. We (Ferretworld) had never been there, but the journey was really the main event. It was a glorious day out on the water with hundreds of boats out in force. I asked my parents if they missed sailing - but they said not, even on such a perfect sailing day. After a nice lunch on the waterfront in Tiburon we headed back to the terminal and got an old trolley bus back to the Ferry Building. San Francsico has a fleet of these rejuvenated trollies (trams) that run on some of the lines. We traveled in a 1936 trolley from Pittsburg. 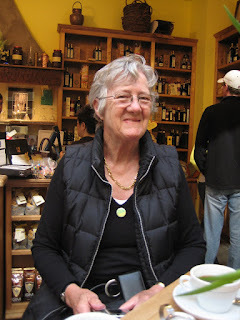 We grabbed a coffee at an Italian bar in the Ferry Building (picture above) before heading home for cake. 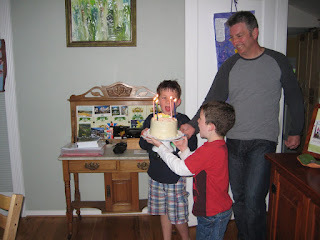 Banana cake from Icing on the Cake - this is the highlight of a birthday as far as the boys are concerned. 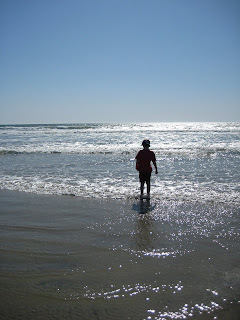 A photo-heavy post from our spring break trip. We were, of course, in lovely San Diego. 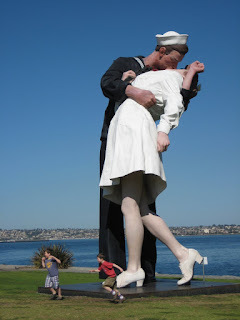 This lovely couple are part of a series of sculptures and other public artwork depicting San Diego's role as a wartime naval base. 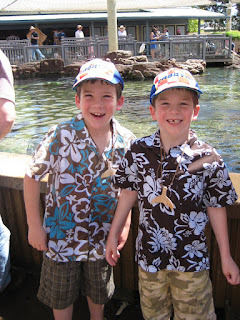 The boys definitely took the vacation business seriously. This is the outfit Finlay planned to travel in - but decided to save it for the proper holiday. We went here of course, however I think we were all a little disappointed with SeaWorld. 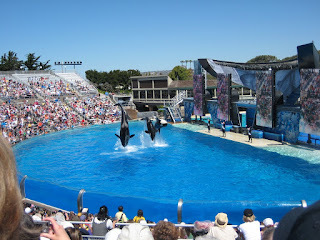 We were expecting more aquarium than theme park...but we all enjoyed the Shamu show. What we really enjoyed was visting some of the ships in the harbour. 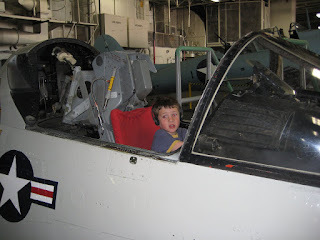 We spent a long time on the USS Midway - Finlay's favourite part = the brig! Here they are in a plane cabin on the mid-deck. 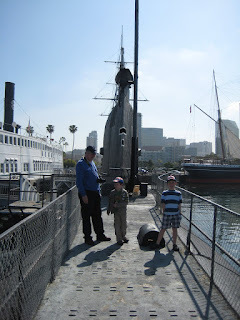 We also spent a day at the Maritime Museum visiting the Foxtrot class submarine, the Star of India Clipper, and the HMS Surprise which is a replica of HMS Rose that was used in the Master and Commander movie. Since I have an abiding interest in the maritime novels of Patrick O'Brien, and the boys have heard a great deal about Napoleonic-era naval warfare, we all enjoyed the visit. We also took a harbour tour on a 1914 pilot boat which was excellent. 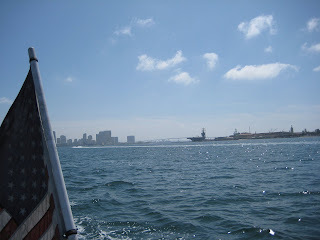 If anyone plans to visit San Diego the Maritime Museum and harbour tour is excellent value as well as excellent. Where in the world was Ferretworld? As it turns out pretty close to home...but rather busy. For the last several weeks we have had visitors, which combined with a ski trip, spring break, easter, and two birthdays, seem to have kept us busy. My parents are visiting from the UK. 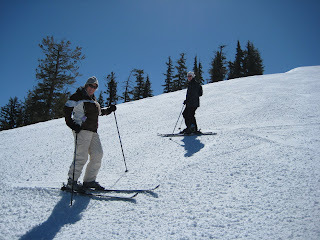 We took advantage of the spring skiing up at Bear which was lovely and sunny. I think all the resorts are closing this weekend so this was probably our last trip of the season - but it was a good one. 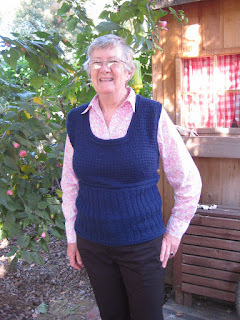 My mother's visit co-incided with the UK Mother's Day this year, and although we can't actually get Mother's day cards here - I did knit Mammie a vest. Here she is modeling the Back to School U-necked vest by Stephanie Japel. It's knitted in Cascade 220 Heathers in the appealingly named colour 9449. I knitted the 39" bust although I would probably have been better to knit a smaller size as the vest suits a moderate negative ease, whereas the 39" is a generous ease on my Mum.